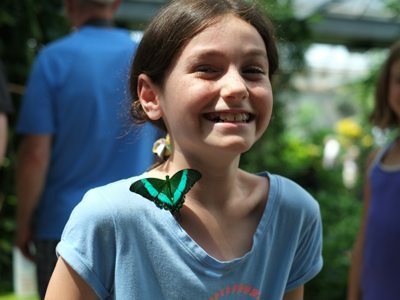 Cambridge Butterfly Conservatory is where learning takes flight! Students’ learning will come to life in a lush, tropical garden – marvel at thousands of free-flying butterflies as you experience the tropics under floral canopies and a cascading waterfall. Your visit to Cambridge Butterfly Conservatory will focus on inquiry and exploration, with a variety of curriculum-linked hands-on activities. It is sure to inspire curiosity and wonder about butterflies and insects, and their importance in the natural world. Each of our Education Programs are 90 minutes in length. Students will journey through the Conservatory in small groups, surrounded by free-flying tropical butterflies, birds, fish, and turtles. Students will also see the Emergence Window, where live butterflies emerge from their chrysalides, dry their wings, and take their first flight into the Conservatory. Students will participate in hands-on activities that are curriculum-specific for each grade level, led by one of our experienced Nature Interpreters. The learning activities focus on small-group inquiry and exploration, allowing students to engage in curriculum topics and build meaningful connections between themselves, butterflies, and the natural world. Students will have the chance to meet some of our live tropical bugs – up close and personal! They will learn about parts of insects by observing and, if they’re brave enough, touching different insects and arachnids. Of the teachers surveyed, our program has a 4.7/5 rating and 100% said they would recommend the program!